ReaLifeSim IV Trainers, worn by real people, provide the opportunity to experience a look, a tone of voice, a facial expression, and a touch. Created and tested by clinicians - nurses, medics, technicians, medical, osteopathic & veterinary doctors. Human interactions with hands-on skills practice - wearable, reusable, and affordable. Lifelike feel simulated skin & prefilled (and refillable) blood vessels provide repeated safe hands-on practice, providing the experience of the "pop" through the skin and "pop" through the vessels followed by a realistic flashback. 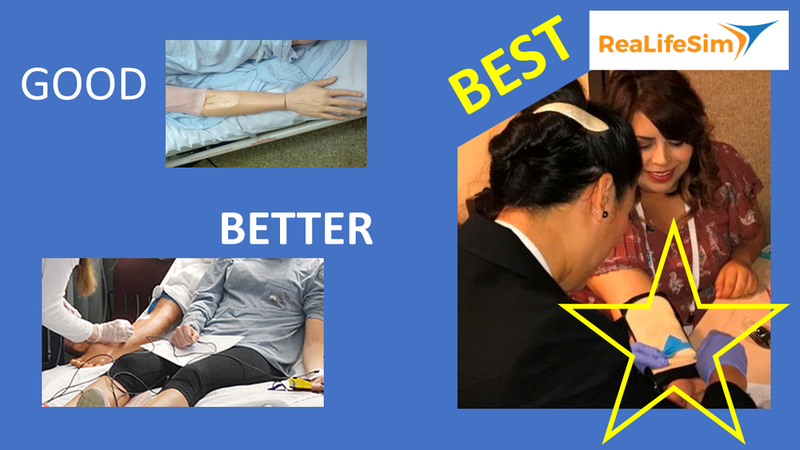 ReaLifeSim provides the highest fidelity wearable vascular access simulation education product available(IV Trainer and Blood Draw Trainer). Don't your learners deserve the best? Put the human factor back into your training.